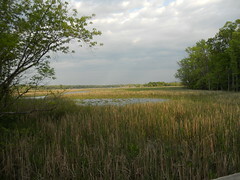 Bike Commute 44: Dyke Marsh in the Evening Light, a photo by Rootchopper on Flickr. Friday was a long day. Left home at 6:40 and left the office 11 hours later. I wondered if I would get home before dark. This being the last work day of April I had plenty of light. For some reason the evening light on Dyke Marsh caught my eye. Dyke Marsh borders about 1 mile of my commute. The tides roll in and out. Some days the reeds are knocked over. Some days all you see are mud flats. Today the water level was just right. In a few days the ducklings and goslings will hatch. They are another highlight of my spring rides to work. Bike Commute 43: Tornado Watch! Bike Commute 43: Tornado Watch!, a photo by Rootchopper on Flickr. 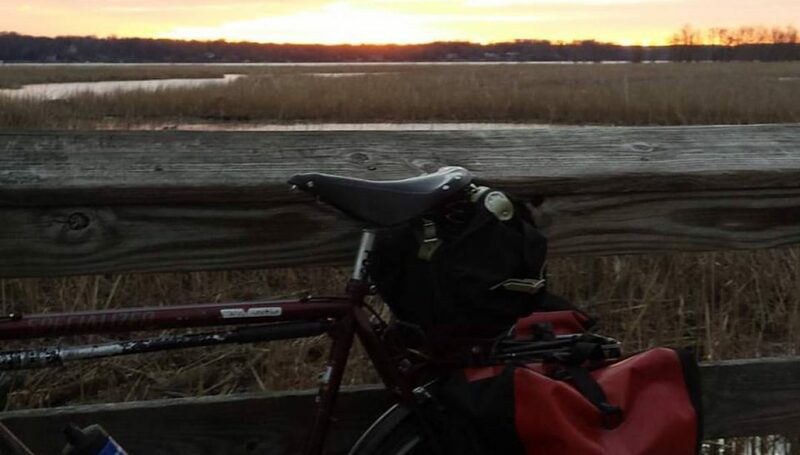 What would a bike commute be like without a little adventure now and then? Before leaving the office, I received emails from Alexandria and Fairfax County advising that those jurisdictions were under a tornado watch this evening. Guess where most of my commute is: Alexandria and Fairfax County. Everything looked a bit cloudy but otherwise unremarkable until I passed under the Beltway. This picture was taken on the Washington Street deck on top of the outer loop of the Beltway. I was about to go left, into the belly of the beast. Other than a strong headwind and a few sprinkles that turned into light rain, the weather was unremarkable, In fact, had I not received the emails, I doubt I would have realized that severe weather was nearby. About a mile from home there were a couple of rumbles of thunder but nothing to worry about ordinarily. after arriving at home, I put the Sequoia away and went inside the house and then the storm hit. Heavy rain, wind, probably some hail. I turned on the television to see ominous Doppler radar images. The storm that was raging outside had spawned a tornado that touched down near Quantico about 30 miles south. And perhaps another tornado hat touched down near Woodbridge, 20 miles to the south. What are the three most important words in bike commuting? Location, location, location,. Bike Commute 42: 27,000 Miles, a photo by Rootchopper on Flickr. Usually, when my odometer is coming up to a milestone, I obsessively stare at it until it rolls over. This one sneaked up on me and I missed it. I guess I’ll just have to ride another 997 miles for my next chance. This could take a while. 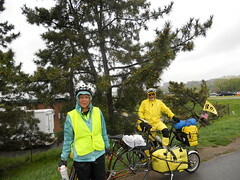 I named my Tour Easy recumbent bicycle Nellie during my bike tour to Indiana. I was coming down Big Savage Mountain in western Maryland when I glanced at my speedometer and saw “45”. I started riding the brakes and saying “Whoa Nellie” like Keith Jackson, the football announcer. If you’ve never done it, riding a bike at high speed on an unfamiliar road is thrilling, and really kind of idiotic All it takes is one pothole and you’re toast. Today, I woke up to a beautiful Easter morning. Mrs. Rootchopper and Teenage Daughter Rootchopper were nestled all snug in their beds, while visions of chocolate bunnies danced in their heads. After a humongous bowl of Cheerios, I decided to go for a bike ride. I chose to ride my recumbent because, all last year, riding it for more than an hour was causing a painful condition in my left foot called Morton’s Neuroma. Imagine a nail being inserted into your foot just an inch behind the gap between your third and fourth toes. It really hurts and it only presents itself when I ride this particular bike. I have a theory that the cause of my condition was not in my foot, rather it had something to do with me moving the seat back on my bike. So I recently moved it just a bit forward. Today’s ride would put my theory to the test. I also decided to see if my legs could take some challenging hills so I picked a course with plenty of them and kept my chain on the big chainring (the hardest to push) for as long as my knees would allow. This would test my knees fitness for the hills of eastern Pennsylvania which are part of my upcoming bike tour. I rode from my house in Mount Vernon VA to Washington DC. 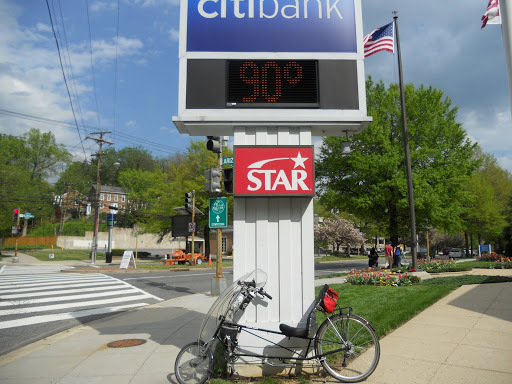 After a brief ride on the Capital Crescent Trail, I rode up to MacArthur Boulevard. I followed MacArthur (thinking “I shall return”) to Persimmon Tree Road which skirts the famous Avenel Golf Course. I continued on to Potomac Village. By this point I had ridden on a dozen or so respectable hills without any problem with foot or knees. The weather was gorgeous so I decided to ride west on River Road. I neglected to stop in Potomac Village to refill my water bottles. Any experienced bicyclist would tell you that this is dumb. Being an experience cyclist I told myself “This is dumb.” So what did I do? I rode on anyway expecting to get water at Poole’s General Store which I thought was only a couple of miles away. After many miles of this I came to a “T” near Bretton Woods Country Club. Still no General Store. Had it closed? I rode on, screaming down a hill at 40 miles per hour. Nellie was willin’ and so was I. At the bottom of the hill I saw the store. CLOSED. Not good. I had maybe 2 ounces of water left. On I rode down one hill and up another. Maybe I’ll knock on someone’s door and ask for water. Maybe I ask the Buddhists at their temple, or the Hare Krishnas at theirs. Not wanting to take the chance of getting converted after getting all that Catholicism from my youth out of my system, I rode on. I finally did what no man is supposed to do. I asked for help. I spotted a cyclist just getting underway at an intersection and asked him where I might find water (That’s a fine looking bottle you have there, Mister.) He told me to just take a right and ride into Poolesville, just up the road a ways. About 15 minutes later I pulled into a gas station with a little convenience store. Water, Gatorade, really crappy snacks! I’m SAVED! All the hill climbing had made my knees sore but the bothersome foot was doing just fine. I rode hard back a slightly different way to River Road. Apparently all the hills up to now had been more up than down. Good news. Nellie smiled. All those high speed descents had masked the rise in temperatures. 90 degrees on Easter. 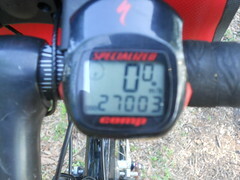 Nellie and I slowed down for the last 20 miles of our ride. The bike paths were packed with families and riders out for a casual (i.e., slow) ride. We pulled into home at 97 miles. My foot feels fine but my knees are aching. I think we passed the audition. Wet and Happy, a photo by Rootchopper on Flickr. One of the extras of riding on the Mount Vernon Trail is meeting up with long-distance bike tourists. The Mount Vernon Trail is part of the East Coast Greenway and the Adventure Cyclists Atlantic Coast Route. The latter goes from Key West to Bar Harbor and is on my bucket list. Today on the way home I stopped to chat with Don and Mary Williams. Don and Mary are (as Leonard Cohen recently said) just two crazy kids with a dream. I didn’t ask their ages but I think they are a few years older than me. They left Jacksonville Florida in mid March and here they are about 3 miles from their destination, Union Station in Washington DC. 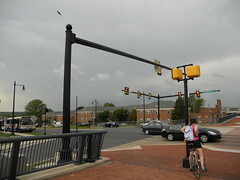 We talked for about 20 minutes about bicycle touring gear, the best parts of the Atlantic Coast route (the outer banks of North Carolina), Amtrak, Crazyguyonabike.com and other stuff while the rain fell and the jets landing at National Airport passed just a few feet over our heads. Bike Commute 41: The Holy Sweater, a photo by Rootchopper on Flickr. 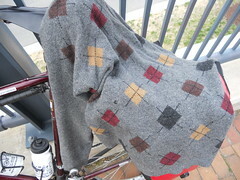 The holey sweater is my insulating layer for winter bike riding. It is made of very soft wool. Any time the temperature falls below 45 degrees, I break out the holey sweater. I rode home today in the rain on a 40 something degree day into a headwind. I was completely comfortable the entire way. I don’t much care that this sweater has holes in it. It’s normally worn under my rainproof Marmot Precip jacket so nobody sees it. I’ll keep wearing it until it falls apart. Before you think about springing for that nice merino wool sweater for your cold-weather biking, ride to a thrift shop and buy a holey sweater. Spend the money you save on hot cocoa. Bike Commute 40: Go Green Stamp, a photo by Rootchopper on Flickr. Tomorrow is Earth Day. I don’t know who decides these things but it would be swift if they’d look at a calendar before holding Earth Day on Good Friday. To avoid the conflict, we celebrated Earth Day today at my office. 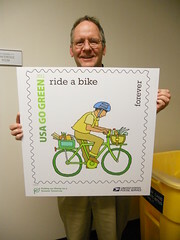 The festivities were tied to a new set of Go Green postage stamps, one of which says “Ride a Bike”. Some of my bike commuting co-workers and I gave out materials promoting cycling. The hottest item was the Washington DC Bicycle Maps. We ran out. We gave away a one-year membership to Capital Bikeshare (CaBi) and many, many one-day trial coupons. Virtually everyone I talked to thought CaBi is an excellent idea. We’d have given away more CaBi materials but for the fact that so many of our co-workers live well beyond the CaBi network. Today’s commute was a little different from my usual 29-mile round trip. I drove my car to Brown’s Honda in the Cherrydale section of North Arlington to get some maintenance done. I could have simply taken their courtesy van to the Metro and ridden to work with the masses. Instead I folded up Little Nellie, my Bike Friday New World Tourist, dropped her in the trunk and used her to do my commute from the dealership. This ride took me on the Martha Custis Trail, down to the Mount Vernon Trail across from Georgetown. It was a beautiful Spring morning with trees and flowers in bloom, pleasant temperatures and sunny skies. In fact, the whole commute was going swimmingly until it got kind of literal. That’s Little Nellie parked across the Mount Vernon Trail in the foreground. The Memorial Bridge is in the backgorund. In between is the Potomac River. It is not supposed to be there. Little Nellie is brave. Little Nellie is proud. Little Nellie is not stupid. We took the high road (or grass) to the right. Once we cleared the deluge we made our way into DC. I cut under the 14th Street Bridge on Ohio Drive to avoid the car traffic on Independence Avenue. Neither Little Nellie nor I are afraid, but we don’t like waiting at traffic lights and dealing with late-for-work policy wonks driving their commute mobiles. 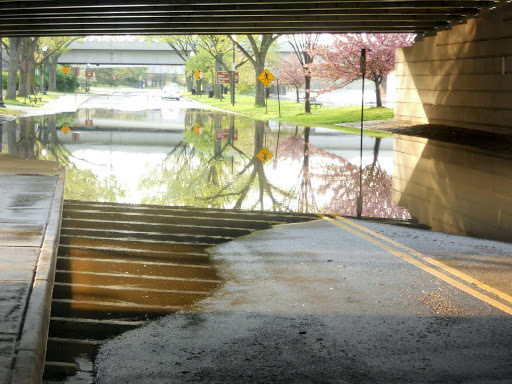 As we came onto Ohio Drive we once again encountered the deluge, this time under the 14th Street Bridge. We knew not to ride through this one when we saw police cars driving up on the sidewalk to the left. After this, it was clear sailing (sorry) all the way to work. 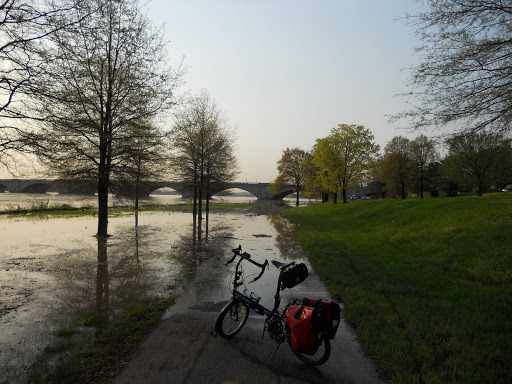 The evening commute was uneventful as the waters had receded. The commute turned out to be 14 1/2 miles, pretty much half my normal commuting distance, not including portages. Planning a bike tour is sometimes as much fun as doing the tour itself. I have long wanted to ride from my hometown of Albany NY to my house in Mount Vernon VA just south of DC. I finally have a chance to pull this tour off with minimal hassle. In mid-May, my son will be finishing his freshman year at Skidmore College in Saratoga Springs, NY. This just happens to be about 35 miles from Albany so I am going to drive a car up with my bike stuff, load his stuff in the car, and send him back to Virginia. I will ride back. The planning for this trip is actually pretty simple. New York State has a growing network of official bike routes with road signs much like regular highway routes. NYS Bike Route 9 runs from New York City to the Canadian border along the east side of the Hudson River. The Adventure Cycling Association produces bike touring maps. The ACA Atlantic Coast route intersects NYS Bike Route 9 just south of Albany. So my route planning couldn’t be easier. I need to decide which bike to take. I could take Bike Nellie, my Tour Easy recumbent. It is great on my back, but lately riding it causes sharp nerve pain in my left foot. I could take Little Nellie, my Bike Friday folding bike, but riding it has been causing discomfort in my left knee. Or I could take my Specialized Sequoia. This bike is great for 20 mile rides but I fear that it would really mess up my surgically repaired back on longer rides. I decided to try each bike at a long distance and see if I could resolve one of these issues. Today, I rode the Sequoia 51-miles from my house to Bethesda and back. The trip took me along the Mount Vernon Trail, into Georgetown, up the Capital Crescent Trail, and along the Georgetown Branch Trail, before returning via Rock Creek Park. 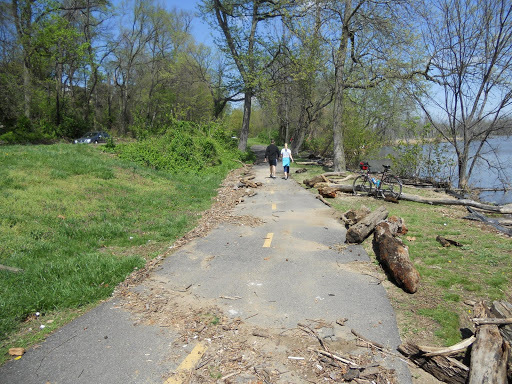 Other than some interesting debris along the Mount Vernon Trail, the ride to Bethesda was uneventful. I felt fine the whole way to Bethesda. As I started making my way back, however, my back gave me a twinge. As is usually the case, this pain came without a warning,. I also happened to be exactly half way into the ride. Even with the back incident this ride was a pleasure. It has been way too long since we had a nice day when I didn’t have a conflict with family, housework, or failure to rise from my slumber. Tomorrow it’s back to bike commuting. Little Nellie will get the call as I have to drop my car at the dealer in Arlington. So, I’ll toss her into the trunk and bike commute from there. . Cheers. 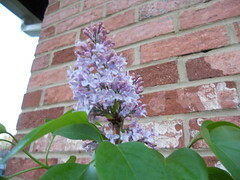 Bike Commute 36: Lilacs!, a photo by Rootchopper on Flickr. When I was little, the best part of early May was the smell of lilac blossoms along the northern side of my grade school. For the next two weeks, I will be treated with that beautiful fragrance every time I go to or from my shed with my bike. Boy, does this beat the cold days of January!